S E Jorgensen, Copenhagen University, Copenhagen, Denmark © 2008 Elsevier B.V. All rights reserved. The most used definition of ecological engineering employs the following formulation: ecological engineer ing is defined as the design of sustainable natural and artificial ecosystems that integrate human society with its natural environment for the benefit of both. It requires, on the one hand, that we understand nature and ensure a sustainable development of natural resources and ecosys tems and, on the other hand, that we make use (but not abuse) of natural resources to the benefit of the human society. Thus, our inevitable interactions with nature must be made under the comprehensive consideration of the sustainability and balance of nature. H. T. Odum was among the first to define ecological engineering as the ''environmental manipulation by man using small amounts of supplementary energy to control systems in which the main energy drives are coming from natural sources.'' Odum further developed the concept of ecological engineering as follows: ecolo gical engineering, the engineering of new ecosystems designs, is a field that uses systems that are mainly self organizing. Straskraba has defined ecological engineering (or eco technology, as he called it) more broadly, as being the use of technological means for ecosystem management, based on a deep ecological understanding, in order to minimize the costs of measures and their harm to the environment. For the purposes of this report, ecological engineering and ecotechnology may be considered synonymous. Ecological engineering is engineering, in the sense that it involves the design of man made or natural ecosystems or parts of ecosystems. Like all engineering disciplines, it is based on basic science, in this case ecology and systems ecology. The biological species are the components applied in ecological engineering. Thus, ecological engineering represents therefore a clear application of ecosystem theory. Ecotechnic is another often applied word but one that also encompasses the development of all types of 'soft' technol ogy applied in society, in addition to ecotechnology or ecological engineering. These types of technology are often based on ecological principles (e.g., all types of cleaner tech nology), particularly if they are applied to solve an environmental problem. The use of ecological principles in the development of technology is denoted as industrial ecology. 1. Phytoremediation. The use of plants in ecological engi neering (e.g., using wetlands to treat wastewater pollutants, or for removing toxic substance from con taminated soil). 2. Ecohydrology. The use of a combination of ecological and hydrological principles to obtain ecologically sound environmental management. Both phytoremidiation and ecohydrology are subdisci plines within the discipline ecological engineering or ecotechnology, which is an often used synonym for eco logical engineering. Further, ecological engineering should not be confused with bioengineering or biotechnology. Biotechnology involves the manipulation of the genetic structure of cells to produce new organisms capable of performing certain functions. Ecotechnology does not involve manipulation at the genetic level, but rather at several steps higher in the ecological hierarchy. The manip ulation takes place on an assemblage of species and/or their abiotic environment, as a self designing system that can adapt to changes brought about by outside forces, whether controlled by humans or by natural forcing functions. Ecological engineering is also not the same thing as environmental engineering, the latter is involved in cleaning processes to prevent pollution problems. It involves the use of settling tanks, filters, scrubbers, and man made components that have nothing to do with the biological and ecological components applied in ecological engineering, even though the use of environmental engi neering is directed to reducing man made forcing functions on ecosystems. As mentioned above, the term ecotechnic may be considered to include a part of envi ronmental technology, namely the part based on ecological principles such as recirculation. The tool boxes of ecologi cal engineering and environmental engineering are completely different; where ecological engineering uses ecosystems, communities, organisms and their immediate abiotic environment, and environmental engineering uses chemical and biotechnological unit processes such as filtra tion, precipitation, and biological decomposition by aeration. Engineering has successfully covered the field of ecological engineering, which has grown rapidly during the 1990s due to increasing acknowledgment of the need to use technologies other than environmental technology in efforts to solve pollution problems. This development does not imply that ecological modeling and ecological engineering are moving in different directions. On the contrary, ecological engineering has increasingly been using models to perform designs of constructed ecosys tems, or to quantify the results of applying specific ecological engineering methods for comparison to alter native, applicable methods. In addition, the relationship between ecological engi neering and systems ecology is very clear. Ecological principles are used widely in practical application of ecological engineering methods. Mitsch and J0rgensen have provided 19 principles that can be used as a checklist to assess if an ecological engineering project follows ecological principles, that is, to determine if a project is ecologically sound. 1. Ecosystems are used to reduce or solve a pollution problem that otherwise would be (more) harmful to other ecosystems. A typical example is the use of wet lands for wastewater treatment. 2. Ecosystems are imitated or copied to reduce or solve a pollution problem, leading to constructed ecosystems. Examples are fishponds and constructed wetlands for treating wastewater or diffuse pollution sources. 3. The recovery of ecosystems after significant distur bances. Examples are coal mine reclamation and restoration of lakes and rivers. 4. The use of ecosystems for the benefit of humanity without destroying the ecological balance (i.e., the utilization of ecosystems on an ecologically sound basis). Typical examples are the use of integrated agriculture and development of organic agriculture; this type of ecotechnology finds wide application in the ecological management of renewable resources. The rationale behind these four classes of ecotechnology is illustrated in Figure 1. It is noted that ecotechnology or ecological engineering operates in the environment and its ecosystems. As already mentioned, it is this domain that ecological engineering employs as its toolbox. Figure 1 An illustration of the four types of ecological engineering. Reproduced by permission of Elsevier. and where ecological engineering is the only method that can offer a proper solution to a problem. Examples are provided in Table 1, where alternative environmental technological solutions are also indicated. This does not imply that ecological engineering can replace envi ronmental engineering. On the contrary, the two technologies should work hand in hand to solve environ mental management problems, better than they could do if applied individually. 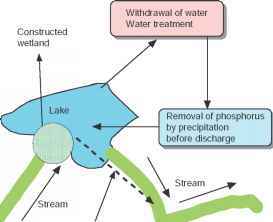 This is illustrated in type 1 eco logical engineering (application of ecosystems to reduce or solve pollution problems) by wetlands utilized to reduce diffuse nutrient loads to lakes. This problem can not be solved by environmental technology. Sludge treatment can be solved by environmental technology, namely by incineration. However, the ecological engi neering solution (i.e., sludge disposal on agricultural land, which involves utilization of the organic material and nutrients in the sludge) is a much sounder method from an ecological perspective. Figure 2 gives an example, where both ecological engineering and environ mental technology are applied to solve an environmental problem. Figure 2 Control of lake eutrophication, illustrating a combination of (1) chemical precipitation for phosphorus removal from wastewater (environmental technology); (2) a wetland to remove nutrients from the inflow (type 1 or 2 ecotechnology); and (3) siphoning of nutrient-rich hypolimnetic water downstream (type 3 ecotechnology). The eutrophication abatement may also be combined in this case with biomanipulation. Reproduced by permission of Elsevier. environmental technology. The application of root zone plants for treating small quantities of wastewater is an example of type 2 ecological engineering, in which the environmental engineering alternative (a mechanical-biological-chemical treatment) cannot compete, when the waste volume is low and/or the area costs are mod erate, mainly because it would involve excessive costs, relative to the quantity of wastewater (sewage system, pumping stations, etc.). A solution requiring fewer resources always will be a more ecologically sound solution. plant, where biological biodegradation of the contami nants would take place. Ecological engineering will propose an in situ treatment with adapted microorganisms or plants. The latter method will be much more cost effective, and the pollution related to transporting the soil will be omitted. Restoration of lakes by biomanipula tion, installation of an impoundment, sediment removal or coverage, siphoning of hypolimnetic water (rich in nutrients) downstream, or by several other proposed eco logical engineering techniques are examples of type 3 ecological engineering. It is difficult to obtain the same results using environmental engineering, because this requires activities in the lake and/or the vicinity of the lake. (whether, e.g., timber or fish) is the best long term strategy from an ecological and economic perspective. Ecologically sound landscape planning is another example of the use of type 4 ecological engineering. Constructed subsurface wetlands may also be used to treat dairy farm wastewater, mine water pollutants, textile wastewater, and pulp mill wastewater. J0rgensen SE (2000) Pollution Abatement in the 21st Century, 488pp. Ecosystem Restoration, 412pp. New York: Wiley. Straskraba M (1985) Simulation Models as Tools in Ecotechnology Systems: Analysis and Simulation, vol. II, 546pp. Berlin: Akademie Verlag.